Archive for the ‘History’ Category. 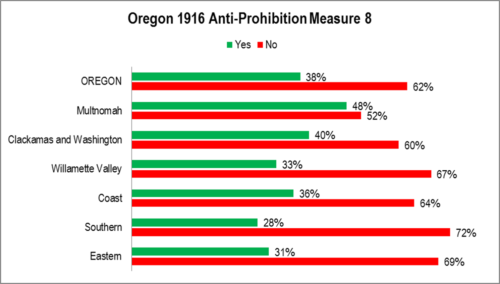 Oregonians outside the more urban Tri-County area voted to support expanding prohibition. 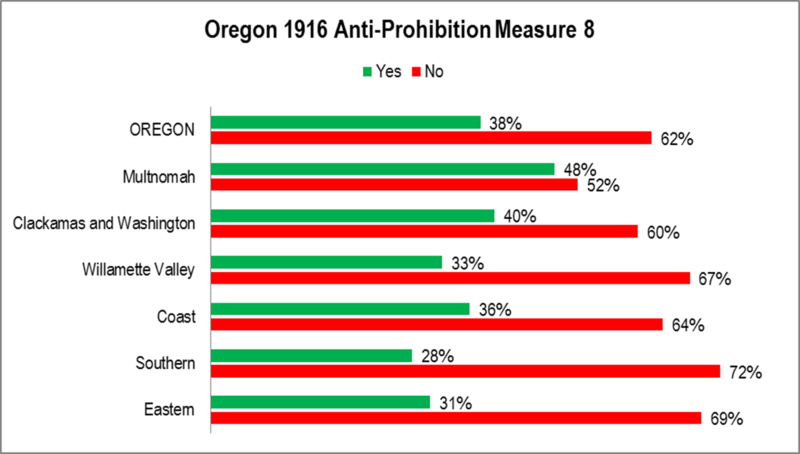 As noted in the last post, the national pattern where urban areas were more supportive and rural areas were less supportive of prohibition also held in Oregon. 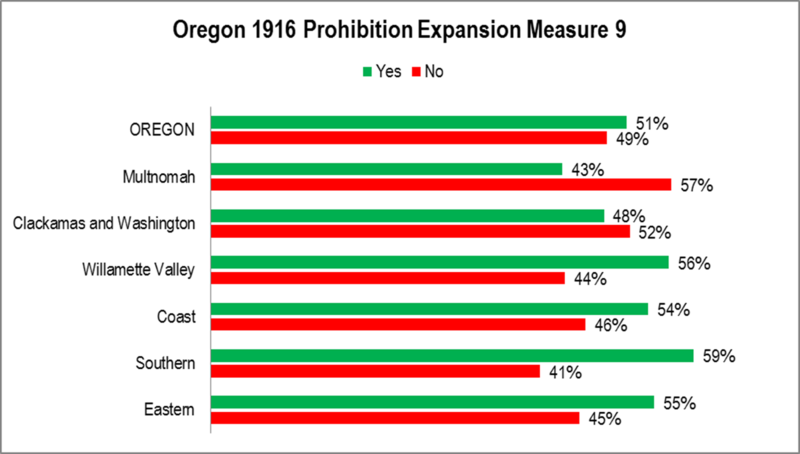 Oregonians had passed a Prohibition Constitutional Amendment in 1914. The 18th Amendment to the United States Constitution only took effect in 1920. In 1916, Oregonians were asked whether they wanted to pull back from prohibition (Measure 8) or to expand the impact of prohibition (measure 9). The rejected pulling back by a landslide. The only place it was close was in Multnomah county. Across the nation prohibition did better in rural areas and worse in urban areas. That was true in Oregon as well. 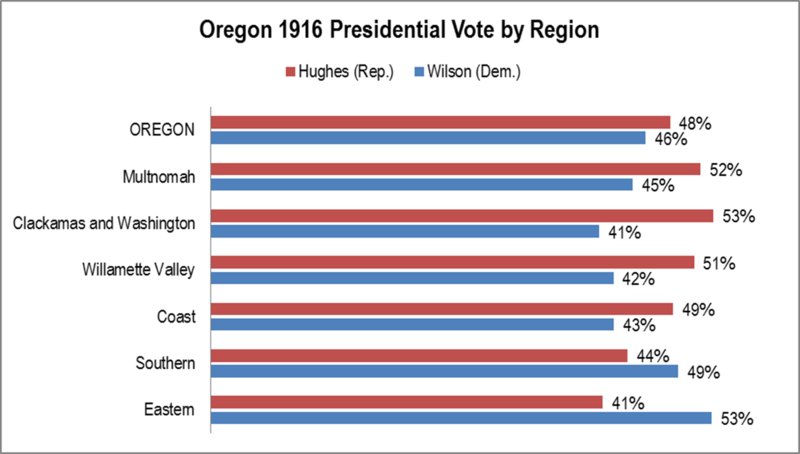 Oregon voted for Republican Charles Evans Hughes over Democrat incumbent President Woodrow Wilson. Wilson had won Oregon in 1912 when incumbent President William Howard Taft and former President Theodore Roosevelt had split the Republican vote. In 1916, both Roosevelt and Taft campaigned for Hughes. Hughes narrowly lost the electoral college. 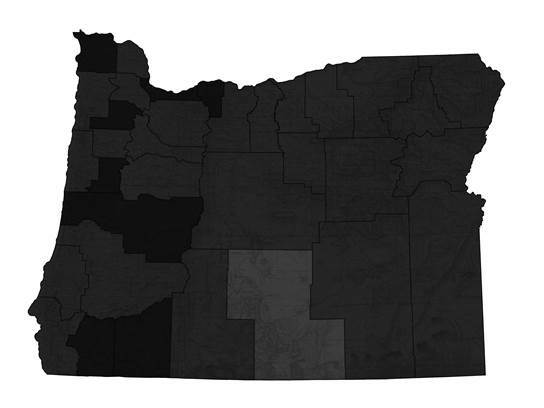 Compared to today there were relatively more voters in Portland (Multnomah County) and in southern and eastern Oregon and substantially less in today’s suburban counties. Women got the vote in Oregon in 1912. The United States only followed in 1920. Many women, particularly older women, were slow to register. That accounts for the still about 60% of voters in 1916 being men. 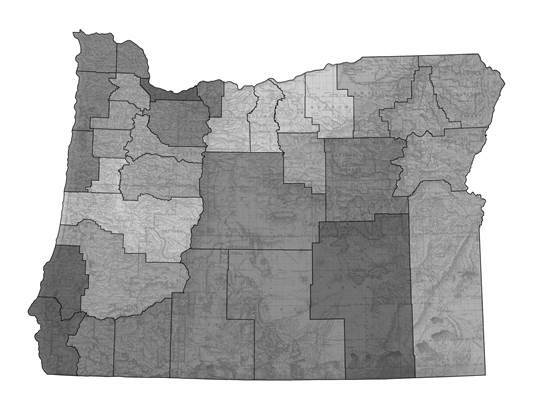 Today there are more women registered in Oregon than men, largely due to longevity. 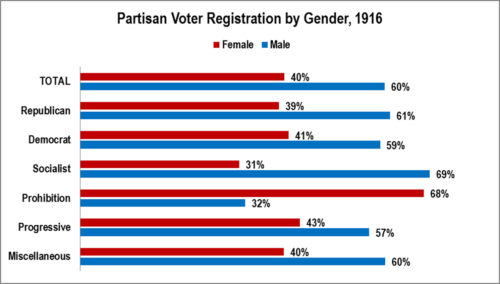 Note that women registered disproportionately for the Prohibition party. Contemporaries credited the passage of a prohibition constitutional amendment in Oregon in 1914 to women receiving the vote. Only men voted on the prohibition in 1910 it failed. The graphic above requires a bit of explanation. 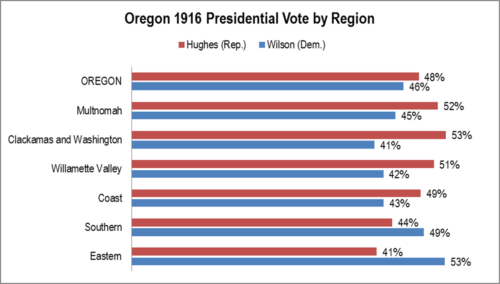 First, Oregon was an overwhelmingly Republican state in 1916 in registration. This continued to be true into the 1930s. Second, there were three partisan primaries in May, 1916: Republican, Democratic, and Progressive. 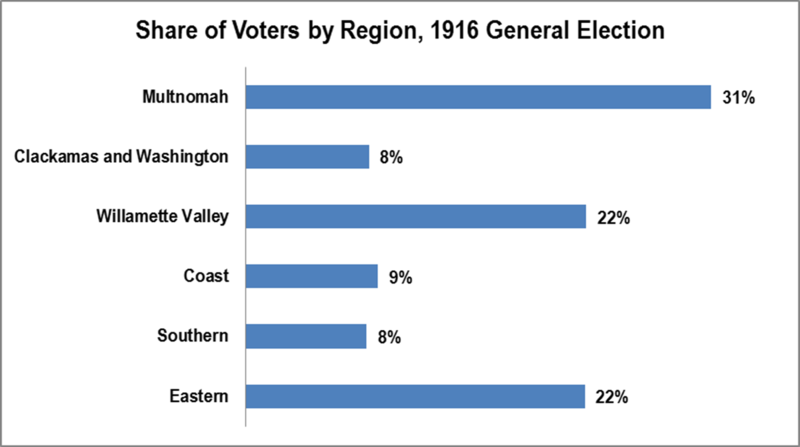 Teddy Roosevelt’s strong performance in the 1912 Oregon General Election qualified the Progressive party to hold primaries in 1914 and 1916. 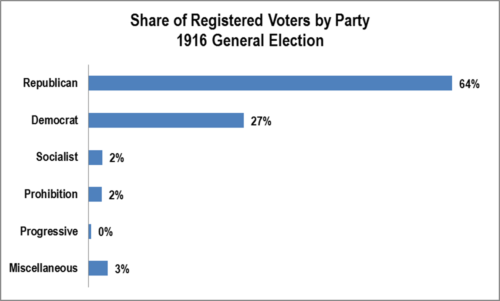 Third, despite holding a primary, as opposed to a nominating convention like the Prohibition and Socialist parties did, there were fewer Progressive party members. It should be noted that registration was a bit different than today. Unlike the permanent registration we have today, registration was annual. One newspaper cartoon of the time showed how the Progressive party registration had no waiting line, unlike the Democrats and Republicans. 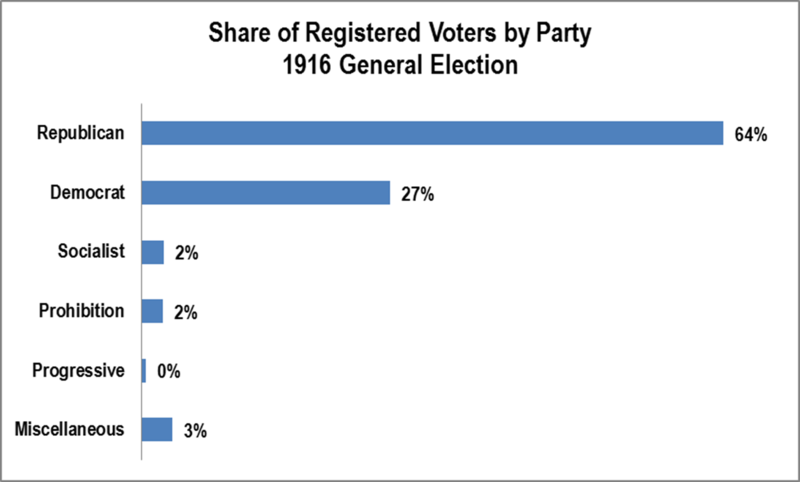 Finally, as one might guess based on the above information, the Progressive Party nominees didn’t get enough votes to maintain a primary after 1916. This year’s primary, 2016, was the first time since 1916 that Oregon had three major party primaries. 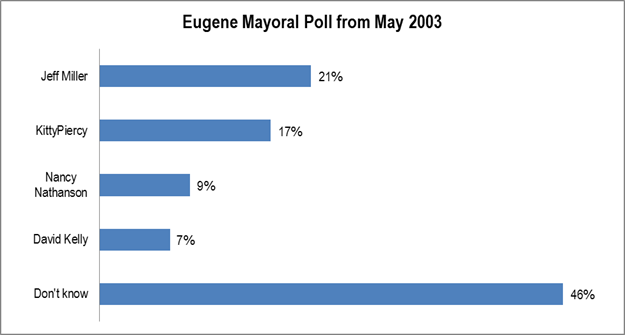 Here’s how some potential candidates for Eugene’s 2004 Mayoral race stood in May 2003. The sample doesn’t exactly match the one in the previous post. It is from May and a General election sample. That said, it’s clear that Miller and Piercy both had developed large citywide constituencies. QUESTION: Now, looking at next year’s mayoral race. Some say Mayor Jim Torrey won’t run for re-election. Some people have already been mentioned as interested in running for mayor. If the election were held today, would you vote for David Kelly, Jeff Miller, Nancy Nathanson, or Kitty Piercy for Mayor ROTATE? METHODOLOGY: 200 live telephone interviews of City of Eugene likely general election voters were conducted the nights of May 7 and 8, 2003. The margin of error at the sample median is 7%. The Single Tax was William S. U’Ren’s most famous proposal. It was designed to change Oregon’s economy and society. It had failed in previous years. This time supporters renamed it and its support increased, but not enough to pass. TAX EXEMPTION AMENDMENT. Its purpose is to exempt from assessment and taxation, dwelling houses, household furniture, live stock, machinery, orchard trees, vines, bushes, shrubs, nursery stock, merchandise, buildings and other improvements on, in and under lands made by clearing, ditching and draining, but not to exempt the land; it is intended to exempt up to $1,500, all kinds of personal property and land improvements of all kinds, but the land itself shall be assessed. Key: Yes percentage in 10 percent increments from 0-10 at far left through 90-100 at far right. Darker indicates a higher yes percentage. It might seem strange today, but. 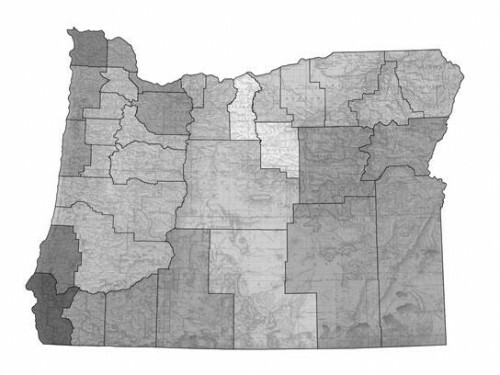 until 1914, certain foreign citizens could vote in Oregon’s elections. This had been true since Oregon became a state. This right was taken away, in an election where foreigners could vote, in a landslide. FOR AMENDMENT of Section 2 of Article II of the Constitution of Oregon, so as to require voters to be citizens of the United States, in all elections, unless otherwise provided for in the Constitution. This is a sign of how far things have changed. The universal 8-hour day measure failed. It was roundly criticized by major newspapers. In fairness, it should be noted that the measure was a radical change at the time. MEASURE 11: Universal Constitutional Eight Hour Day Amendment REFERRED BY INITIATIVE FAILED CONSTITUTIONAL EIGHT HOUR DAY AMENDMENT. Its purpose is to add Section 9 to Article XV of the Oregon Constitution prohibiting any man, woman, boy or girl, from being employed more than eight hours in anyone day, or forty-eight hours in anyone week, in any trade, business or profession, 01′ on any farm, or in domestic service, or in any kind of employment whatever, skilled 01′ unskilled, mental 01′ physical, within the State of Oregon. This law applies to children and other relatives of the employers, and provides penalty for violation thereof. Key: Yes percentage in 10 percent increments from 0-10 at far left through 90-100 at far right. Darker indicates a higher yes percentage.